Over on the Unproduced Scripts page there are 18 original scripts up. Among them is Flash by Charles – Four girls driving on Halloween are chased after they flash at a car with no headlights on. It is a short script – 10 pages, in RTF format. It is an interesting take on the Gang High-beam Initiation urban legend. The premise is good. The execution does need some work – the usual – formatting needs to be cleaned up. Spelling, punctuation and grammar need a once over. The ending of the script is clever, however the discussion at the end seems to come out of nowhere. This is a good first draft that needs a lot of work, but shows promise. You can check it out along with any one of eighteen other unproduced scripts on the Unproduced Scripts page. Thanks to Donovan and Daily Script read this early draft of Larry Cohen’s Cellular. Donovan writes, [This is] an early draft of Cellular which holds a lot of surprises if you’re familiar with the finished (and completely different) product. Cohen’s draft starts with the same premise, then veers off into unexpected territory. Enjoy. First the Theme and Genre and then, for the uninitiated, an explanation of the One Week Challenge (OWC). Write a script that is 12 pages or less (in a generally accepted screenwriting format) on the theme and genre by 11:59 pm October 5th, 2007. Submit your script here. After you’ve finished your script, you can join the trash talk over on the October ’07 OWC Discussion Board. What can you win: Nothing (it is a challenge, not a contest, so have fun with it). Around October 14th the true names of the writers will be revealed. One script will be selected, through some criteria yet to be determined, and it will be recorded by iScript.com and released on MP3 on October 31st. Scripts into mp3s! 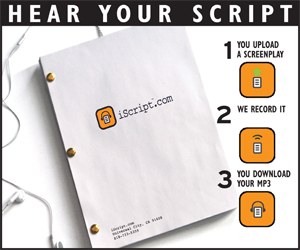 You upload a script – they record it using professional readers and picky sound editors – you download your iScript! Burn CDs, listen on your iPod, submit it to execs, producers, agents. Now people can hear your script while driving, jogging or relaxing. Click here to learn more! *It is considered good form that if you enter, you read and review at least three or more of your fellow entrants providing constructive criticism. Some of the more clever of you (or discussion board regulars) are already aware of this, but Simplyscripts has a podcast feed. currently the feed is limited to just audio performances of scripts found on the site. We can be found on Podcast Alley and Podcast Ready and iTunes. You can also use iTunes Oneclick to subscribe or you can subscribe to our main feed here. What is holding this feed up is folks like Pia and Wesley and Spencer who have graciously allowed me to put their iScripts into the SimplyScripts podcast feed. Thanks to “Vern” for the heads up on this one. Over on Horror Lair, thanks to “Anonymous P” you can read Roman Polanski’s final draft script of Rosemary’s Baby which is based on the novel of the same name by Ira Levin. It centers on Rosemary Woodhouse, a young mother-to-be, who begins to suspect her elderly neighbors are not the kindly souls they appear to be. She soon discovers they are the leaders of a coven of witches and her husband, a struggling actor, allowed the devil to impregnate her in exchange for a successful career, but she is unable to convince anyone to believe her. She is eventually informed that she is the mother of the long-awaited anti-christ. You can check it out on the Movie Scripts page. A timid father and shop owner finds encouragement in an unexpected hero to stand up against the town bullies and help put an end to their reign of terror. Entries (RSS) and Comments (RSS) | 66 queries. 0.223 seconds.